Okay so here I go again. I’m about 3 months postpartum and ready to actually make this pregnancy fat vacate the premises. I battle between being okay with it and miserable. But in the end, it’s my gluttony that wants it to be okay (and I can’t buy a new wardrobe anyway just to serve my love of poke cakes). I began intermittent fasting once again about 12 days ago. In that time I have lost nearly 4 lbs. You can say this is water weight, but this “water weight” was not moving through days of clean eating and high intensity interval training workouts like Insanity. I have been stuck at a weight that I’d rather not say. Every time it would get below aforementioned unmentionable number it would bounce right back up. With this way of eating, I feel I have gained control of the scale AND my eating/cravings/gluttony/etc. My results after first baby.
. If you like to eat low carb, eat low carb. If you like to eat clean, do that. If you like donuts every “morning” for breakfast, you can do that (sort of- more on that later). I choose to eat a fairly large meal most days as my first meal and it usually consist of eggs. That’s really my only consistency. I will add also that my chosen method of intermittent fasting is lean gains or 16/8. I don’t follow this strictly. In the beginning, I continue to shorten my eating window until I get the desired effects & weight loss. My sweet spot is about a 6 hour eating window. I usually eat between 1:30 and 7:30 or 8:00. You are strengthening that will-power, self-control muscle. This is a muscle that along with your own physical muscles atrophies during pregnancy. Day before delivery (baby 2) and day after. The reason I think this diet works great for losing postpartum weight is because like I said: You are strengthening that will-power, self-control muscle. This is a muscle that along with your own physical muscles atrophies during pregnancy (for most of us mortal women). After months of never telling yourself “no” (understandably), it can be a real challenge to get back to the reality of some self-denial. Feeling hunger and saying no for many hours strengthens this ability. It’s much easier to tell yourself no when “yes” is just around the corner like pushing yourself running up a hill is easier when you know there is a downhill coming. Also, and along these same lines, you are able to eat more satisfying meals including dessert if you want. It’s difficult to eat 1500-1800 calories (the recommended caloric restriction recommended for breastfeeding moms that want to lose weight) if you spread those calories over 18 hours, 3 meals and 3 snacks. But if you are eating two large meals or one large meal, then we are talking 800-1000 calorie meals. That is a ton of food if it’s clean food! And a good-sized portion even if it’s not. So you are sort of hitting it from both angles. But then there is another thing that happens. Because of the biological effects of fasting each day, your appetite and cravings change. You suddenly find that even though your eating window opens, you’re not really feeling that much urgency to eat. And you’re craving mango-topped tilapia and rice! Yesterday, for example, I was craving oatmeal with brown sugar and butter. So I had a big bowl for my first meal. Another reason this works great for breastfeeding moms is the rate of weight loss. It is between 1 & 2 lbs per week which is completely healthy for baby. 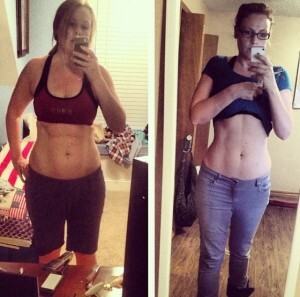 And lastly… Intermittent Fasting helps you take charge of those dang hunger hormones!!! And lastly… Intermittent Fasting helps you take charge of those dang hunger hormones!!! In pregnancy and breastfeeding there is an increase in the hunger hormone called ghrelin. There is also an increase in insulin-resistance (or lowering of insulin sensitivity). And although Human Growth Hormone is elevated by pregnancy and breastfeeding, there is evidence that the effect is compounded with fasting. Ghrelin. This little devil is what makes you STARVING after a breastfeeding session. It definitely works against any fat loss goals during the first 6 months of breastfeeding. Usually ghrelin levels begin normalizing at around 6 months post partum, and this is why breastfeeding moms tend to lose the most weight between months 6-12 versus formula-feeding moms that tend to lose it sooner. And lastly, HGH or human growth hormone. Remember when people used to inject or ingest this and then starve themselves aka fasting to lose a massive amount of weight quickly. (Are people still doing that?) Well, I confess I actually haven’t studied the science on this one. It’s something about survival of the baby making the body release fat stores more readily. But I know that these levels are already elevated in pregnant and breastfeeding women. So, IF would only heighten these levels causing an even greater fat burning effect. Also, you are fasting every day so those hours would be optimized for fat burning. Energy & Intermittent Fasting: Something all Breastfeeding Moms Need! Right now I’m typing with one hand, rocking Kate with the other. Sofia is rustling from her nap. I need energy to keep up with these two! I guess every body needs extra energy, but breastfeeding moms especially whether you’re a new mom or two under two or mom of four. The times of fasting, you don’t have to devote to putting together a meal. One less meal every day really adds up to quite a bit more free time. Plus, don’t ask me why but there is an increase in natural energy, creativity, and heightened mood & awareness. These are very valuable weapons to add to your mom arsenal any mom will tell you. I usually break my fast after nap time and after I have prepared lunch and fed it to my toddler. It works out great. For a list of FREE and CHEAP resources on intermittent fasting specifically for women. 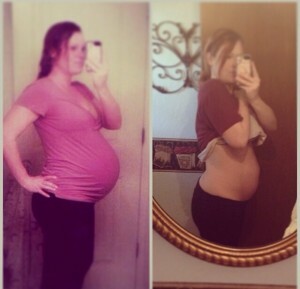 I’m entirely too embarrassed to post my before and afters until my after gets a little back to pre-baby/normal. But in a couple weeks, I will most likely post an update which includes progress photos. I also plan to post some very necessary tips for success that I didn’t have time to post here now. I’ve got two babies screaming. Gotta go! Thanks so much for the info. My baby turned six months yesterday… I have been wanting to start IF. How has IF effected yout breast milk/ baby? Have you ever fasted for 24 hrs? Has this effected your milk supply? I am a nursing IF mom and am afraid to fast for 24 hrs.